Red Valve’s Series 48 Pressure Sensor protects and isolates insrumentation, eliminating plugging and fouling that can occur in slurry and hard-to-gauge liquid applications. 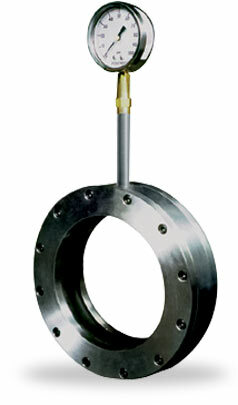 The economical Series 48 is designed to fit inside the bolt pattern of the pipe flanges, allowing for ease of installation and reducing the size of the unit. Series 48 sensors are designed to fit Class 150 and 300 flange drilling, DIN, BS NP10, or any customer specified piping systems. Reliable, accurate instrument readings are often difficult or even impossible to obtain in pipelines carrying slurry, solids or chemical process. Standard diaphragm seals are vulnerable to plugging by debris or deposits and only give a pressure reading from one small area. With the Series 48 Pressure Sensor these problems are eliminated. The principle of operation is that line pressure is sensed through a flexible rubber sleeve which is a full 360° circumference of the pipe ID. The captive fluid is displaced through the Series 48 Pressure Sensor body to the instrument’s Bourdon tube. All instrumentation is protected from the process, which assures accurate, repeatable pressure readings.